A favorite summer spot for me and Matt is Mill Pond House in Centerport. It’s located right on 25A and has a wonderful, inexpensive price fixe menu for lunch and dinner. A 3-course lunch is only $21.95 and you have a lot of choices. It’s not like one of those you-can-only-choose-from-these-two-disgusting-leftovers price fixes. Although we’ve been there a half dozen times, we’ve never actually eaten IN the restaurant. 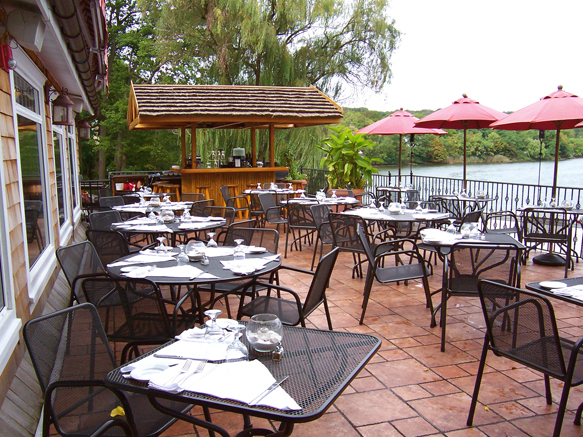 It has a lovely deck on the back that overlooks the water so we always opt to eat there. This image doesn’t show their new awning – no more blinding sun! #2 – Son: Daddy, do your friends have kids? Dad: No, son. My friend’s wife couldn’t have children. Next > Just like twins! This reminds me of an episode like 10 years ago at Three Villages Inn that I oddly remember – two men in suits at an adjacent table talking about smuggling rubies (or is it rupees?…whatever – more than one ruby) during Sunday brunch….ANOTHER MIMOSA PLEASE!